The tender, slightly sweet meat of a crab is usually prepared by immersing the meat-filled shells into boiling water for several minutes. While boiling will probably remain the most common way to prepare this delicate seafood, you can also grill crab, imbuing the meat with a subtle smoky flavor. 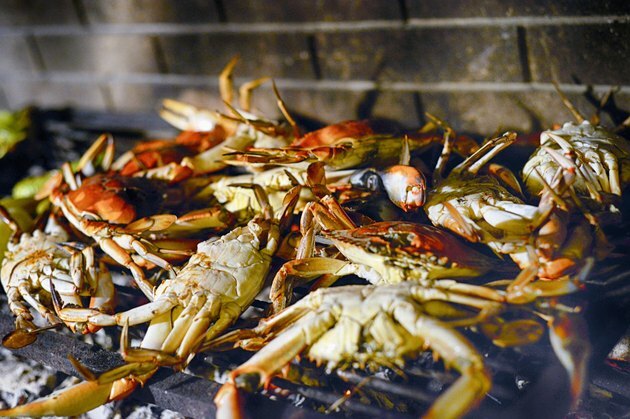 Grilling also preserves the health benefits of the crab as a low-fat, rich source of protein. If you are grilling larger crabs, like Dungeness, Alaskan king crab or snow crab, only grill the legs. Grill smaller soft-shell crab, like blue crab, whole. Thaw your crab by placing it in a large container of cool water and letting it rest for several hours. Some crabs, like Alaskan king crab and snow crab, are rarely available fresh and come in precooked, flash frozen packages. Set your grill for direct heat and a medium-high temperature, or hot enough to allow you to keep your hand just above the grill grate for approximately 3 seconds. Arrange your crab on the grill evenly, using tongs. If you are grilling legs, place the thicker portions near the center or hottest portion of the grill. Grill your crab for approximately three to five minutes per side. Precooked crab requires less time. Fresh, raw crab takes an additional minute per side to ensure that the meat is cooked. Many traditionalists advocate serving crab with melted butter but you should consider a healthier flavor booster. Try marinading your crab in a low-fat oil based salad dressing or seafood marinade for an hour before grilling. The marinade will help impart flavor without leaving behind added calories. The crab shells will be very hot when they come off the grill. Let them cool for a minute or two before you handle them.